Winter is here. It’s been here for a few days, now. We had a minor snow fall last weekend, and the snow has stayed. Hubby’s heavy jackets, and winter gloves and toques are unpacked. And he’s been skiing once already. So it’s official, for him. But, me… I’ve been thinking that I should delay hauling out my winter coats until the very last minute. I’ve been trying to come up with outfit combinations that involve extending the season for my fall jackets, while at the same time trying not to freeze various parts of my anatomy. So I’ve been looking for outfit inspiration while pedalling my exercise bike, perusing on-line images, and leafing through magazines from the last few months. I love all the monochrome looks I’ve found. Not monochrome in the standard matchy-matchy way. But outfits comprised of a single colour theme, with differing shades, and textures. Like these looks below. The red outfit is from Victoria Beckham Fall 2017. The blue/grey look is on Victoria Beckham, so one presumes it’s from her own collection. And the cream sweater and pants are from Max Mara Fall 2017. I love all these looks. Since I saw that all red outfit in Vogue, I’ve been hoping to find a long skirt that I can wear with the Akris burgundy sweater I bought earlier this fall. But, I’m really only half-heartedly looking. And in the meantime, I thought I might cobble together my own monochromatic-ish look from items in my closet. Hence we see below. My Akris sweater with burgundy NYDJ jeans from 2015, a chocolate brown Akris leather moto jacket that I bought almost ten years ago, and a double-faced wool scarf bought at Holt Renfrew in 2010. Oh, and my Stan Smith sneakers. I could wear my brown Paul Green boots with this outfit, but I thought the sneakers were more fun. For accessories I wore my Anne Marie Chagnon earrings from Magpie Jewellry here in Ottawa. 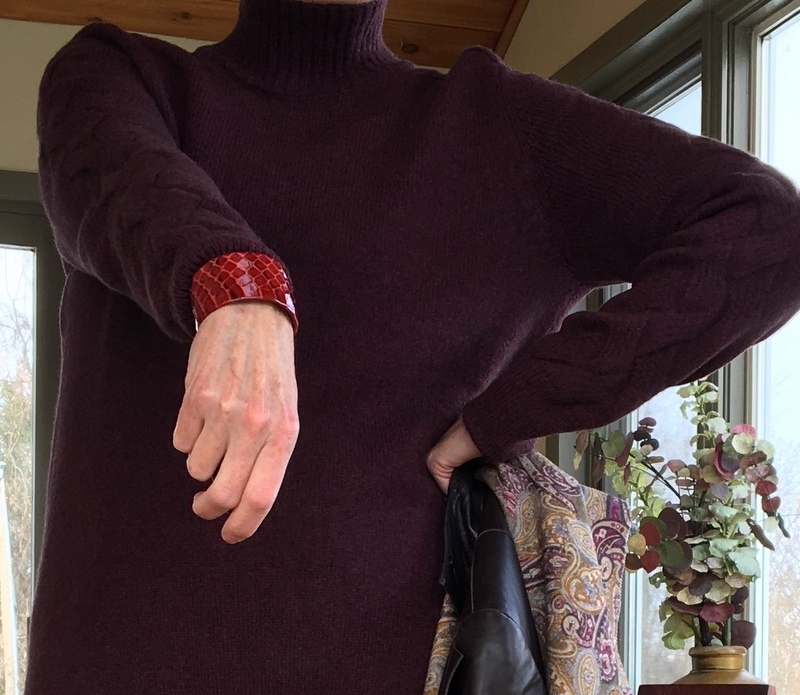 And a leather cuff that I bought at Covent Garden Market in London in October. From an artisan named Caroline Faiers. The great thing about her cuffs is that they can be adjusted for my small wrist. Hurray. You can find more information about Caroline Faiers’ collection here. And you can see Anne Marie Chagnon’s work at her on-line store here. So, off I go to town. Stopping for my gloves and purse on the way out. Hubby is making boeuf bourguignon for dinner. I won’t say that my outfit inspired him, but nevertheless, one suspects that might be the case. Actually, it’s my Mum’s oven beef stew recipe, to which we add red wine, and lots and lots of different kinds of mushrooms. I’m off to shop for red wine and crusty bread which will accompany the perfect dinner for a crisp, early winter evening. In my opinion, anyway. See? There’s just a dusting of snow. Now… back to my earlier comment about not freezing various parts of my anatomy. I’m still willing to make some sacrifices in the name of fashion. Of course, nothing like we used to do back in the day. Ha. But even though I’m wearing my light leather jacket, I’m not willing to be cold. So to that end, I have pantyhose on under my jeans. Heavy socks in my sneakers; I hate cold ankles. My Akris sweater is cosy and warm under my jacket and scarf. And I’m wearing dark brown leather gloves, that you can’t see here. 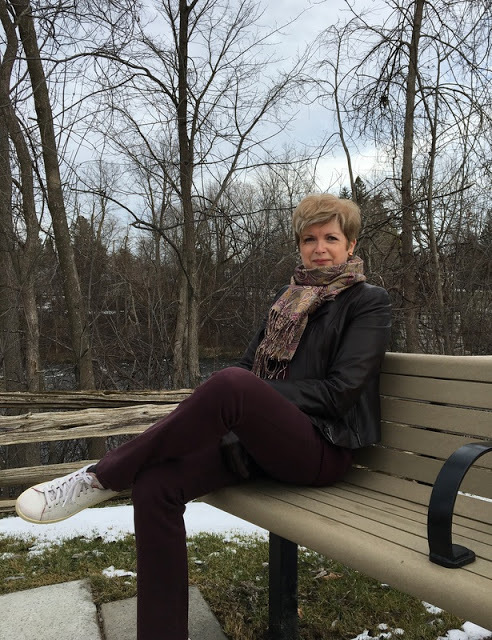 So, I’m warm enough to take a break from errand running and sit on a bench in this little riverside park in Manotick. For a few minutes, anyway. And speaking of Manotick. A couple of months ago I ran into a lovely woman while out shopping. She stopped to say hello because she recognized me from my blog. I was really surprised. And tickled pink, to be honest. She lives in Manotick too. And she told me she found my blog from a mention on Sue/Une Femme‘s blog. We laughed at how amazing blog-land is that a woman from Manotick who, while reading a blog written by a woman in California, finds out about a blog written by someone who also lives in Manotick. Cool, eh? I hope all my American friends had a wonderful Thanksgiving. And since the Black Friday shopping craze seems to have spread from America to Canada, and even to the UK… hope you managed to be safe on the biggest shopping day of the year. I didn’t hear any reports of anyone getting trampled this year. Or maybe you just shopped on-line. Or even better, maybe you just gave Black Friday a miss altogether. And shopped your closet. Or… or… maybe you just made some boeuf bourguignon, popped it into the oven, and curled up with a good book. Ah. Now that’s more my style. How about you my friends? 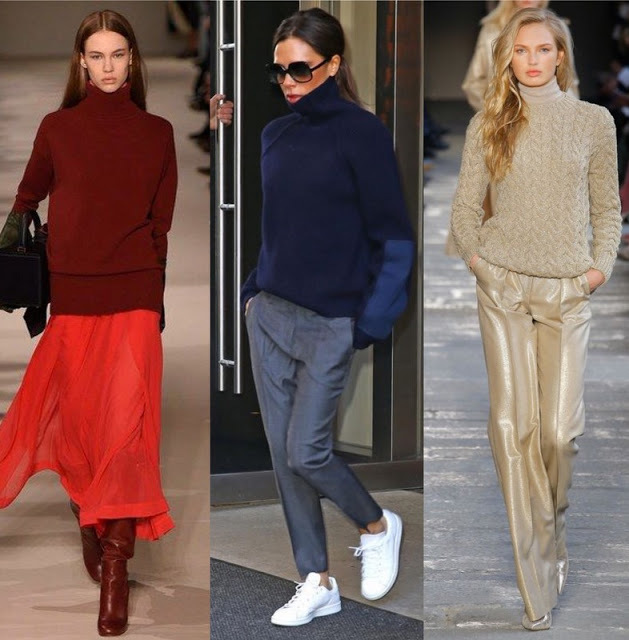 Do you like monochromatic dressing? Or even monochromatic-ish? Did you head out to do battle for the bargains on Black Friday? Lovely outfit for you! You look great (and warm). I like monochromatic dressing & it’s slimming too – not that you need to worry about that . We are all supposed to prune our wardrobes regularly but your outfit shows the virtue of hanging on to the good stuff & recycling . That Covent Garden piece is a lovely souvenir too . I am going into the city tomorrow for a little Xmas shopping but Black Friday doesn’t have a great effect here . I don’t think I’ll be in any danger of being trampled . Oh brrr, looks pretty, but cold. What contrast. I was in my town today wearing just a sweater dress and opaques! I love your look and yes I love monochromatic dressing, or one-colour dressing as I probably would have called it, pre-blog, if I called it anything at all, for I probably didn't ever talk about what I wore or what I saw! Your all in one burgundy looks effortless chic. You look like the sort of stylish lady one occasionally spots out shopping and immediately you find yourself mesmerized, inspired and mentally noting everything about her look. And I did agree with you, it's far better to stay home tomorrow and your day of hubby cooking and you nipping out stylishly for simple fare sounded pretty idyllic. I know… I say things now that I wouldn't have before I started blogging. However… I can't bring myself to say "bootie" … that makes me feel silly. Lovely outfit and very stylish one-you have a very well equipped closet. Beautiful bracelet! Thanks, Dottoressa. No Black Friday for me either. I went for a facial instead. They worked well for a sunny but chilly day,felt casually smart …easy to add and remove layers as necessary … accessorised with grey bag and black boots! Have a good day Sue. Thanks, Rosie. Your outfit sounds lovely. Where are you off to? This all sounds very sensible and cosy. One pot dinners in the warmth are exactly what chilly weather calls for. It has gone cold here too – heard a neighbour scraping his windscreen today, so simply turned over. For me it is all too simple: on with the thick, fake fur coat which resists wind, rain, mud, snow. Look like a Babushka but that is fine. As for Black Friday. Just: no. We really do not need any further excuses to buy piles of crap here in the UK. Enjoy all the crisp air. One pot meals in the winter are so cosy and homey, I think. I have my Gortex for the mud, and snow, and rain… and my down coat for the cold. But fur (fake or otherwise) would be cosier. Do the Stan Smiths have good traction? I'm so conscious about the possibility of slipping on the city sidewalks here once there's a skiff of snow or ice. My sneakers will probably stay in the closet now until March or April (although they might be allowed to come to Italy. . . ). I've been having trouble with those burgundy jeans. They seen to need grey or black, but I'm glad I tried the matching sweater. The Stan Smiths have absolutely no traction. I'd be risking life and limb to wear them on a real winter day. P.S. Isn't that bracelet divine? I could have bought more than one… but…small suitcase. When I was in my 20's a male friend, who flipped houses, told me "Two colors rich, three colors poor." Needless to say, keeping the colors in the same family is very chic! That red outfit with the chiffon skirt and oversized sweater is lovely although I'd look like an Oompa Loompa in it. You on the other hand with your long legs would look amazing in it. Your semi-monochromatic style is very chic considering we do give up so much for warmth here. I'm hoping my inability to comment has been conquered. Just in case I'll copy this comment again. I will admit I was lured into Anthropologie today against my better judgment. I was very reasonable and only came out with a tea towel and a belt and I ended up winning $25 towards my next purchase. Of course that pretty much ensures I'll go back into their store again. Sorry about the comment problems. I've been having trouble commenting on some blogs because my computer security doesn't like the captcha thingie. I googled what to do and tried a few things but gave up. Why are these things so hard??? My wardrobe tends to be quite monochromatic… largely black, white and grey… rather like our winters, I'm afraid! I'm actually working on adding more colour. 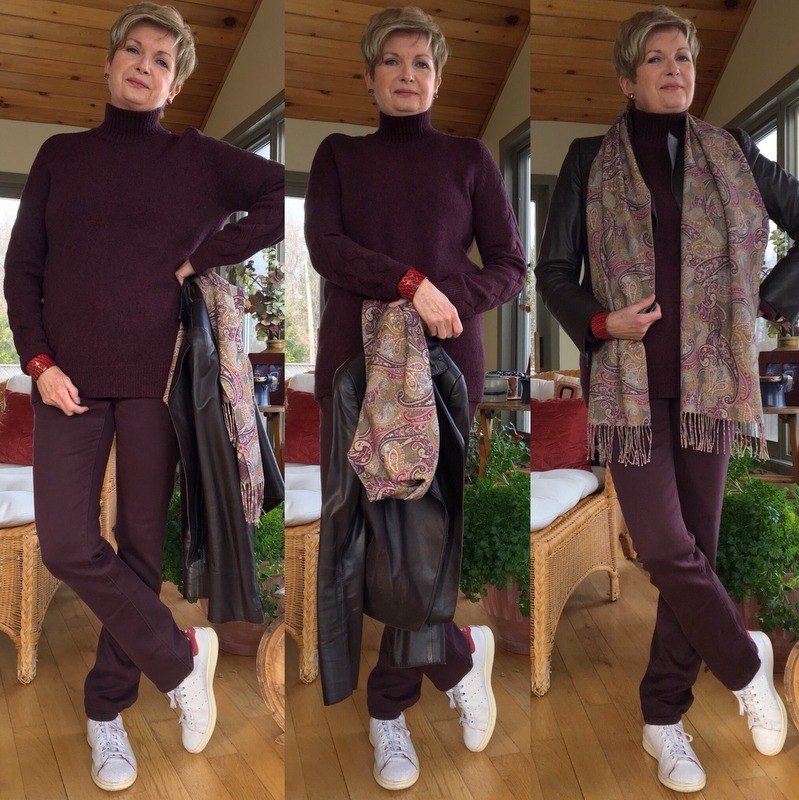 Your burgundy based outfit looks great! I'm staying away from the Black Friday sales. I really don't like shopping when the stores are crowded. Thanks, Elaine. Now that I'm retired and can choose when to shop, I always go when it's less crowded. Can't imagine standing in line to shop! Gives me the shivers even thinking about it. No to monochromatic days;), yes to monochromatic looks! Lovely look dear – simple but statement like. I always love going for monochrome or at least repeating the same colour in various parts of an outfit. Thanks. I'm very interested these days with variations of the same colour in an outfit. Big sale days have never attracted me ( too many people and too many of them are rude and/or crazy ). I'd rather pay more and avoid the crap. As for monochrome dressing, I have gone with a black top and dark jeans or slacks and there is a favorite blue sweatshirt I wear over blue denims. I love navy with dark denim. Oh, yes… I forgot… I have a woollen navy V-neck sweater I wear with blue denims and usually a crewneck T-shirt or turtleneck skivvy underneath.